We all probably tell ourselves that we would exhibit adroit social skills when meeting a beloved celebrity, but there are a lot of people out there who are not so mentally sharp in the heat of the moment. Former Friday Night Lights and Breaking Bad star Jesse Plemons knows all about how weird some fans can get. Here, he describes two scenarios, both involving Breaking Bad fanatics. I have had a few really odd picture requests. Like one, someone wanted me to sort of make a gun with my hand and then pretend to shoot them in the picture. Another guy really wanted to fake strangle me in the picture. And I didn’t do it, but I feel like, maybe I should’ve. Well, if that person’s goal wasn’t actually getting a picture taken but rather “cementing himself inside the memory banks of Jesse Plemons, so that he may speak about the incident on a late night show,” then I have to conclude it was a success. Many congratulations, person. Now, those requests are definitely understandable, to a certain extent, if you’ve watched Breaking Bad the whole way through. (Spoilers follow, if not.) Plemons’ character, the dutiful Todd, was killed off in the series finale as Jesse choked him out with shackles and snapped his neck, thus the strangle request; although I have to wonder if those people happened to have some heavy duty shackles with them when they asked. 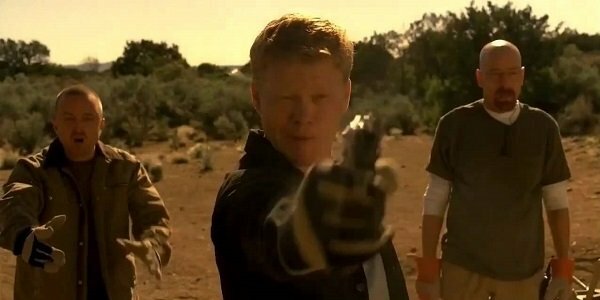 And then as far as a picture of Plemons making a gun-hand at them, one can never forget the classic episode ”Dead Freight,” in which he shoots a child who stumbles upon Todd, Walt and Jesse doing bad things. Gah, that scene. Who would want to relive that in a personal photograph? WHO, I ASK YOU? Or maybe that person was referencing another scene where Todd shot something. Whatever. To contrast these kinds of requests, Plemons also told Seth Meyers about how Friday Night Lights fans don’t do that kind of thing at all. They just kind of expect him to be himself, because Landry Clarke = Jesse Plemons, and vice versa. We will not accept a reality where this is not true. You can check out the entire interview clip below. You can catch Late Night with Seth Meyers every weeknight on NBC, and Plemons is currently starring as one-half of the extremely awkward Blumquist couple on Season 2 of FX’s Fargo. I wonder if fans will ask him to take a picture where he’s acting like he’s scrubbing the blood out of the ground. Wait, The Breaking Bad Movie Still Hasn't Signed Aaron Paul?